If you've found a lower price on a New Fitness Trampoline from JumpSport from an Authorized Dealer, please let us know and we'll match the price! Why Exercise Trampolines on a Futon Website you ask? Because we believe in them! We have known for quite some time, the many health benefits from Jumping. Many health authorities and doctors consider it the best all around exercise. We found that locally, we could only purchase Fitness Trampolines for $39 for a very low end model, to about $100 for another low end model. Our tests with all the different brand names found that these $39 to $100 models, were terrible quality, and didn't last us more than 90 days before welds broke, mats ripped, and everything started to weaken. Then you'll find several higher priced rebounders that still use old fashion springs, which stretch out, and wear out like a pair of cheap shoes. Then, you'll find the German made models at around $800.00. They are great quality, but $800.00? 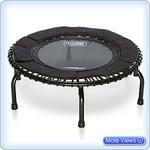 Then we found The Fitness Trampoline, by Jump Sport. With it's no spring, and near silent operation, and the fact that the feel was very close to the most expensive German made trampoline, at less than half the price, we were sold on it. The most important thing about rebounding, or jumping is that it's fun. Have you ever gone to a Hotel with your young kids and tried to keep them from jumping from bed to bed? When exercise is fun, we are more likely to stick with it. 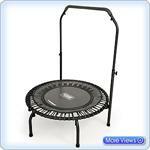 Buy a Rebounder and you'll find your kids will use it, and love it. And they won't even have to know how good it is for them. It's like floating in space at the top of the jump, and while you're at the bottom you're at 2 or 3 times the force of gravity. This movement has many positive effects on your body. The following are some of the benefits of jumping. NASA uses jumping as an exercise for Astronauts after a mission. Your Lymph System is your body's waste plant. There is double the amount of Lymphatic liquid in our bodys, than Blood, but unlike your heart, there is no pump for your Lymph system. The only way your Lymph system can function is by movement and exercise. Without lymph movement every cell in your body is sitting in it's own waste, and starving for nutrients. This can cause, or increase the likelyhood of many degenerative diseases and aging. Jumping can increase Lymph flow by 15 to 30 times. The main Lymph vessels go up your legs, arms and torso, which is why the up and down movement of jumping is so effective. The healthier your Lymph system is the better it can do it's job of removing dead, and cancerous cells, nitrogen wastes, fat, infections, heavy metals and other toxins your cells are trying to remove from your body. Jumping stimulates all internal organs and moves your cerebral spinal fluid, and your intestines. Many immune cells, such as T-Cells move around on their own in your body. These cells become stronger due to the G Forces put upon them during jumping, and they become more active. Jumping is a great way to reduce stress. It's a very relaxing action, and even when you are through, it tends to help keep you relaxed to remove physical and emotional stress. Can help you get a better nights sleep and relax more. These are just some of the many health benefits of Jumping. We recommend The Fitness Trampoline by Jump Sport, as the best Bang for your Jump. But, if you can't afford one of these models, pick one up locally. 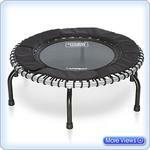 Even a $39.00 one, or find a used one on Craigslist or something, but start Jumping. Once you do, you'll immediately feel better mentally and physically, and the more you stick with it, you will start to see the benefits of jumping. Of course the higher quality Jumpers provide a smoother, and better feel, and because of that you'll tend to stick with it. If you look for a used Jumper on Craigslist, you'll see hundreds of the $39 to $99 models, being sold by people who didn't like them, and didn't stick with it. You won't see hardly any of the higher quality Jumpers, because people enjoy jumping on them, and they stick with it, and don't put them in a corner to gather dust. Good Luck, and Happy, Healthy Jumping.